Around this time last year, this post may have been considered controversial – I may have bottled posting it altogether! This year though, I’ve been empowered by Ofsted (no…that’s not a typo; nor have I been drinking). That’s right; the government body that’s had me running scared for so long have – this year – improved my work:life balance. 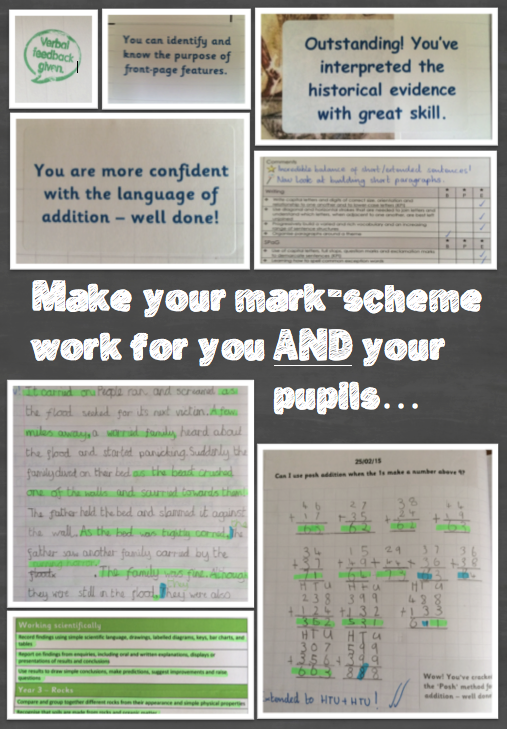 Marking and assessment: the add-on to our working day. The bit that other people don’t get; that bit that hides us away from our own kids or stops us attending the bbq. The antonym of a free evening. Paired with planning, it can devour an NQT and take down even the most experienced and savvy of our colleagues. Cue the superhero come to save the day; the saviour of our schools; the end to our suffering. Cue…Ofsted? Over the last twelve months, we’ve experimented with highlighters, stickers, stampers and tick-lists. We’ve evaluated and found what works for us and our pupils; we’ve recognised that our pupils learn better when their teachers are happier – not rocket science is it? 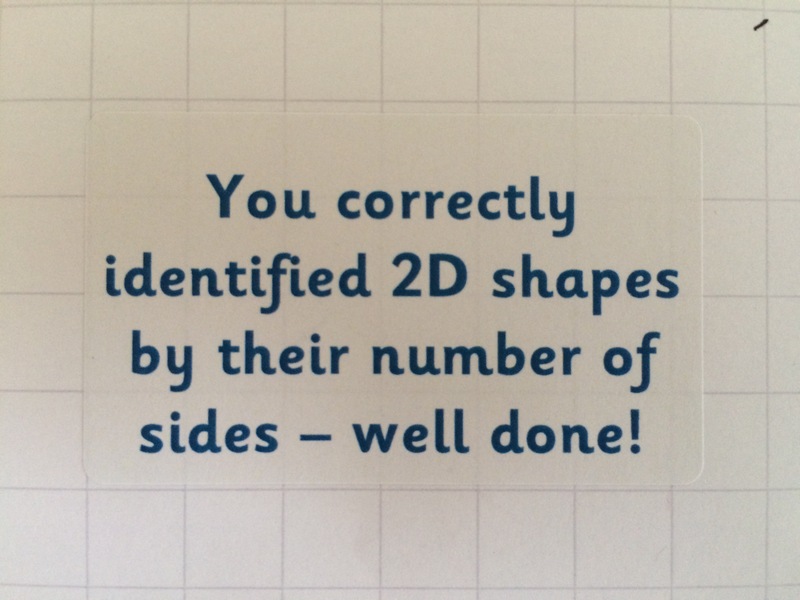 Above are examples of how we are – through our marking policy – empowered to print and use stickers when written feedback might match a learning challenge or look similar across large groups of pupils. I might replace a word or add ‘beginning to’ or ‘developing’ onto half a sheet of them – once the template is set up, it’s a doddle. 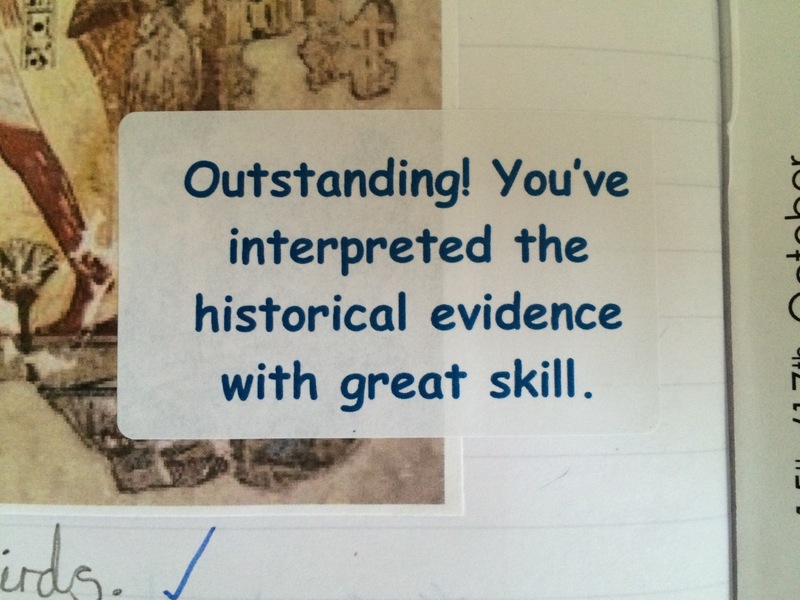 We are given packs of sticker-sheets at the start of a school year; we’ve shaved around 75% off our marking time yet provided (at least) the same quality feedback. 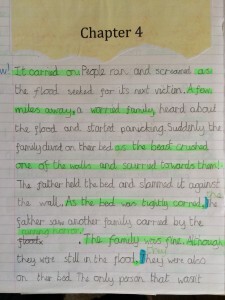 Most schools now use highlighters and we’ve joined the ranks. 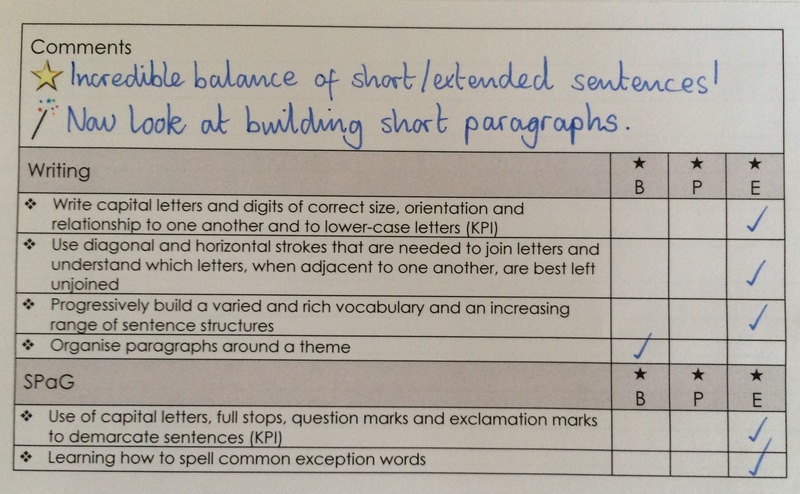 Opting for a two-colour system, pupils can quickly identify success and mistakes; they engage with feedback far more and aren’t put-off by long written responses that they struggle to read. Below, are two different examples of its use in English and maths. 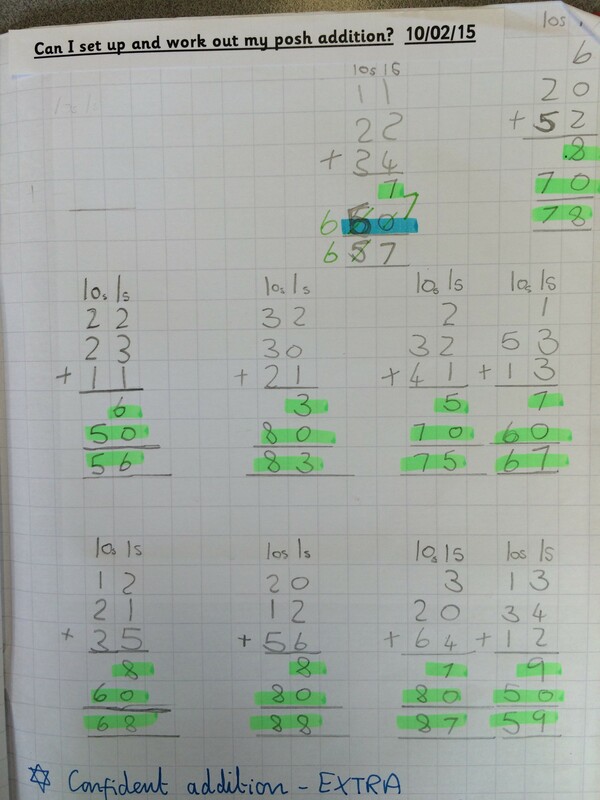 Our ‘deep marking’ has also been scaled back in light of Ofsted’s clarification. 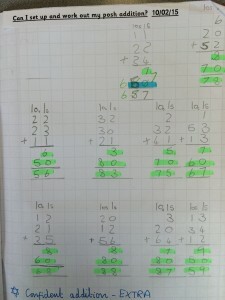 Below are examples of how mark sheets are being devised to assess against new curriculum outcomes in a way that’s appealing to pupils and teachers alike. 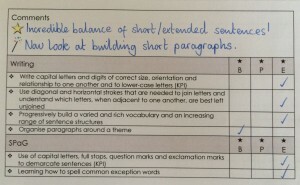 The science was assessed as a block with outcomes assessed at either green, orange or red; the English was an independent end-piece and uses the idea of outcomes being assessed at ‘beginning’, ‘progressing/developing’ or ’embedded’ level. The true joy of this publication is in its title: ‘clarification’ – to make something clear; free from ambiguity. 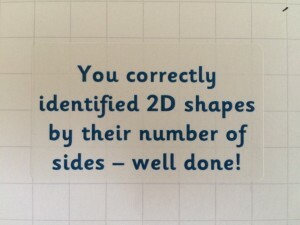 Thanks, Ofsted. 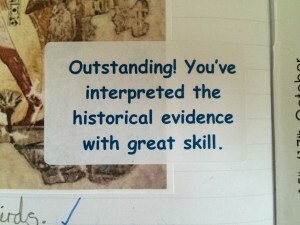 We are ‘allowed'; we have the ‘pass’ we’ve been begging for; the holy grail of teaching gifts! Wave the document in the air and force through change. 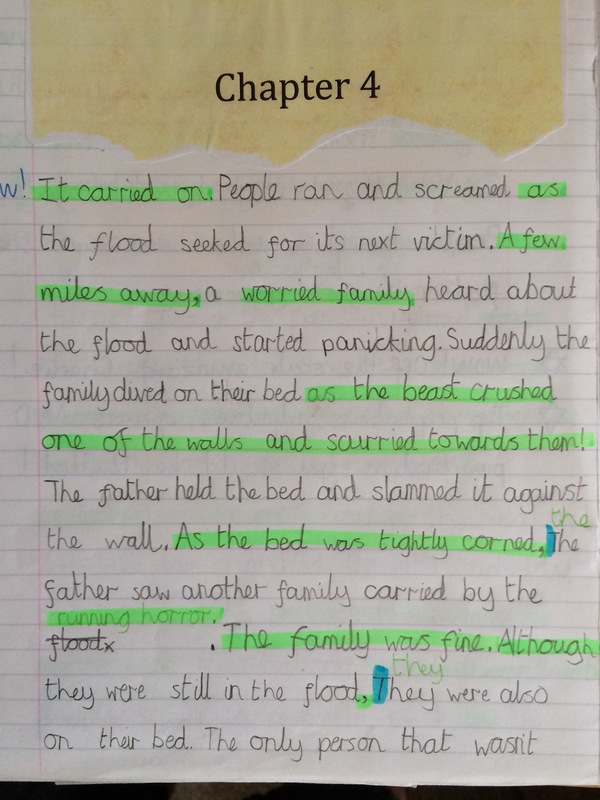 Read it – the freebies don’t stop at marking. I’ve attached a link to the full publication below (just a couple of pages long) so you can see for yourselves what’s no longer expected. Read it. It could change your life. Read it.